Too often, the modus operandi for many organizations is to receive requests and filter them through a stage-gate process in order to evaluate the merit of the request and select the right projects. If the project is selected, a project team is assembled and the project planning begins. There is nothing wrong with this process, in fact, it is an important component of portfolio management. The shortcoming relates to the lack of strategic planning and portfolio planning. Strategic planning occurs once a strategic direction has been established within the organization. It is beyond the scope of this post to discuss how strategy is developed. Rather, our focus is on executing the strategy. The primary assumption is that strategies have been developed. From here, the senior leaders should be able to outline the major items they believe are necessary to accomplish or fulfill the strategy. These major items help define what the company intends to do on a larger scale (“the big whats”). Going one step further, the senior leaders may have an idea of when these major items need to be initiated. With this information, a strategic roadmap can be built to lay out when major components of the strategies should be executed. This strategic roadmap is a critical component of strategic planning. At this point, we are looking at strategic components from a 50,000 foot view. Few details may exist for each major component listed. If more information can be provided, all the better. The critical point is that the senior leaders outline some of the major items needed for the completion of the strategy. Before the traditional portfolio management practitioners raise their arms in protest, I would point out that all of these projects will be reviewed like any other project and need to be prioritized. The creation of a strategic roadmap does not violate key PPM principles. Rather, the strategic roadmap aids the portfolio planning process by acknowledging major efforts that need to be undertaken. Without this view, it is all too easy for decision makers to approve projects (perhaps the right projects) at the wrong time. The creation of a strategic roadmap is a proactive step of leadership to better manage the portfolio. It is far easier to anticipate resource shortages when you can see all of the major efforts on the horizon. It is also easier to acknowledge the need for strong prioritization when key strategic projects compete for resources with smaller projects. The strategic roadmap is a key deliverable of the strategic planning process and is a major input for good portfolio planning. Portfolio planning at a more tactical level helps senior leadership know when projects will get worked. Portfolio planning improves overall portfolio success by taking into account the limited resources (financial and human) and comparing this against known project dependencies in order to properly sequence projects. Strategic planning is proactive work that outlines the major components needed to accomplish strategic goals. Strategic planning will not account for the numerous small projects that get requested throughout the year (that’s the role of the portfolio management process). Portfolio planning utilizes select information from all project requests (large and small) to sequence the projects (based on dependencies, resource constraints, and priorities) in a way that creates an ideal portfolio at a given point in time. 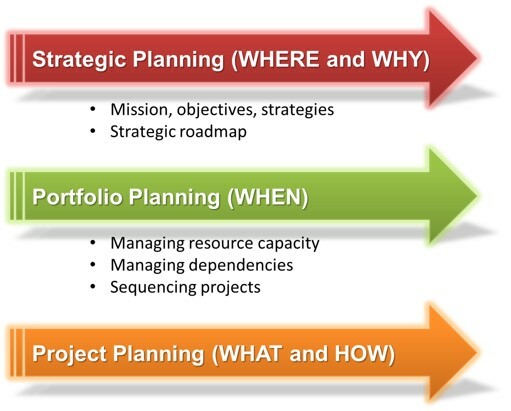 The chart above highlights three parallel steps of the planning process: strategic planning, portfolio planning, and project planning. Strategic planning often covers a 1-3 year planning horizon (or longer) and is generally longer than portfolio planning and project planning (except for large and/or complex projects).